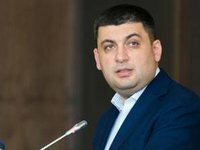 Prime Minister Volodymyr Groysman says that the Cabinet of Ministers at a meeting on Wednesday, March 1, will take the order of import/export of goods from the uncontrolled territories of Donetsk and Luhansk regions. "Tomorrow we will take the government's decision on the critical positions that are important for the economy of Ukraine and for ensuring of our energy independence. And this will be a rule that will regulate the movement of critical components, as well as a small number of necessary components," the prime minister said during a meeting with the representatives of the steel industry in Kyiv on Tuesday.